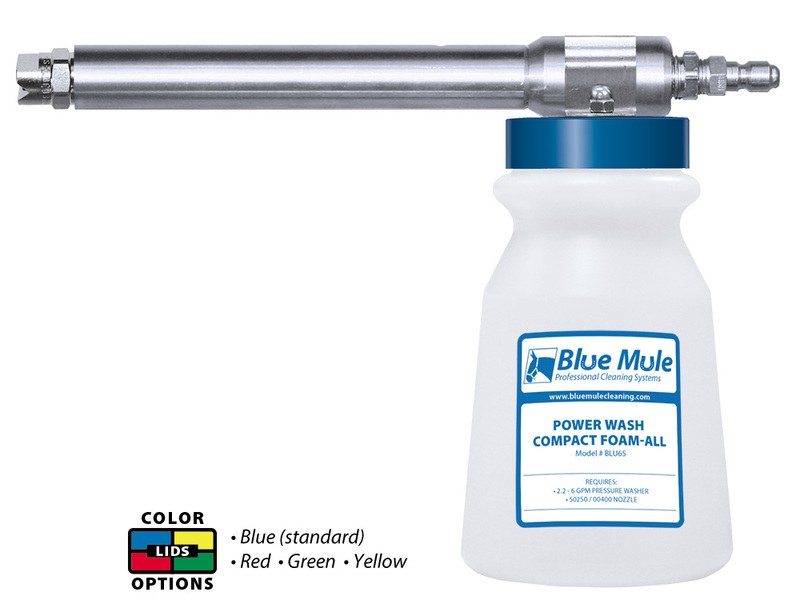 Designed for 2.2 – 6 GPM pressure washers, the Blue Mule Power Wash Compact Foam-All is a machined stainless steel venturi system that quick connects to the trigger gun of a pressure washer. The system draws chemical concentrate from the attached bottle, dilutes the concentrate to the required ratio and projects the solution as a wet, clinging foam. This hose end system can apply more aggressive chemicals since no chemical passes through the pressure washer pump, hose or trigger gun. Metering tips provide for up to 21 dilution ratios. For use wherever a pressure washer is needed, such as for cleaning buildings, vehicles, equipment or concrete. The Power Wash Compact Foam-All will provide a foam throw of up to 25 feet using a 4 GPM pressure washer (distance varies based on volume). Foamer body is one solid piece of machined stainless steel – built to last!